Sipping too many adult beverages out of a red solo cup is a rite of passage in becoming a full-fledged human being. We've all done it. 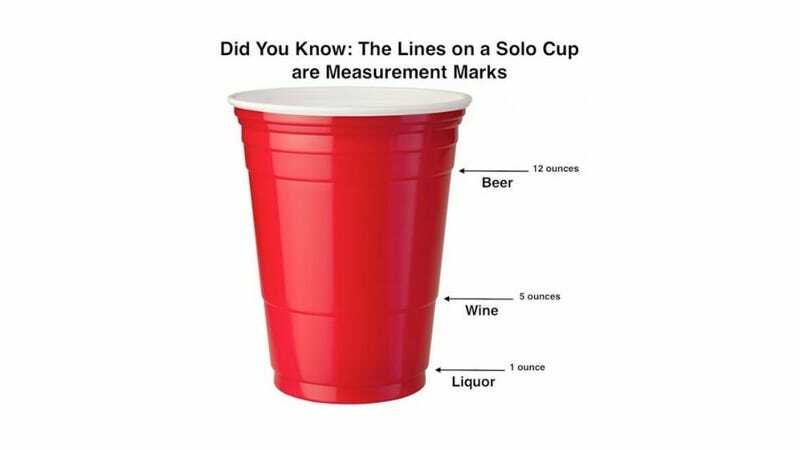 But have you ever wondered what the lines of a red solo cup mean? They're measurements for different types of alcohol. That makes so much logical sense! A line for liquor, for wine and for a can of beer. It also makes like no real-life sense because the line for liquor is prick-specific pathetic, the line for wine would make you question why you're drinking wine out of a red solo cup and the line for beer is completely ignored, you're filling the carbonated deliciousness to the very top. Actually, let's be honest. The only line that really matters in a red solo cup is the lip line. Anyway! The more you know. The lines have more purpose than design, grip or existing for beer pong. And even if Solo is sadly moving away from these iconic red cups for newer red cups, you can try and retroactively remember this for past house parties. Although the lines on our Solo cups match up pretty closely with common liquid measurements, they aren't meant for that.